5. in obedience to Ḏât-Ḥ[imyâm]. Their use of a logogram is unideal, and their reading from right to left is unusual given the picture of the worshiping man and the higher column on the left. I read it from left to right. I also read it in essentially a midway script that is on some level close to Arabian but bears unusual similarities both to Ugaritic and Wadi el-Hol. "In the inner tent, may he be delighted and strengthened by the songs of the Merciful One." As I noted in a comment to my previous post, this can be read as a single dialect of Northwest Semitic, closely related to a northern variant of Hebrew (noting the s1 rather than d_ or z). The word order probably means this isn't Hebrew as such, but the prospective phonology indicates the same thing. Like at Sinai, given the use of the bow for S1, I'd bet this script lacked a way to render a distinct T_. However, the paleography is on some level very close to South Arabian (noting the Alephs, down-pointing H.'s,**** B's, and R's). 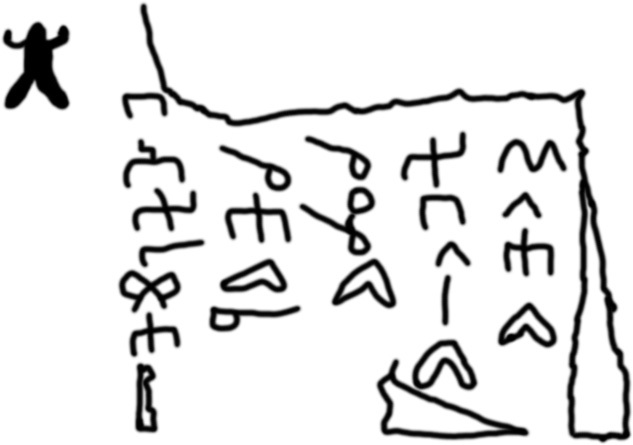 However, the H (upturned/downturned arm characters) shows affinity with Wadi el-Hol and possibly drawings found at Thebes just over a century ago. In other words, the script is arguably liminal between odd variants found outside of Sinai in South Egypt and this script found in Yemen (but in a non-Yemeni language). To wit, it appears to use the bow-S1 as at Ugarit and Sinai, but not the H/H. sibilant shift found at Ugarit but not found in Arabia. That is absolutely astonishing, and this inscription could be, for instance, or could be a part of the exact script that led to that transmission to Arabia - retained at least in principle from the trend found at Wadi el-Hol. Yet it also lacks the distinctly present sibilants also found at Wadi el-Hol (which retains S1, S2, and T_) and in Arabia. So perhaps, it's a variant offshoot somewhere from the middle of that evolution. But broader conclusions are for a later day. Though obscure and unusual, the vocabulary is evidenced in archaic Hebrew. For instance, RH.M appears as rh.wm in Exodus 34:6 (referring to Merciful God); thus the form here is exactly the archaically condensed form expected. Similarly, although `Z.M (`S.M) appears as "to break the bones" in the Bible, it also appears as "to make mighty" - (Psalms 105:24). In this context, the Bible appears to be summarizing God's covenant with prior Prophets and then refers to God making God's people too mighty for their enemies. 'HL can mean tent, and commonly does, including in the Bible. See Genesis 4:20. The weakest support is for H.MD which I initially interpreted as "praise." However, that meaning is not preserved in Hebrew, Aramaic, or Ugaritic, all of which generally preserve a meaning of "desire" or "covet." This root is the source of the infamous biblical thou shalt not "covet" language. However, the substrate Biblical meaning, found explicitly in Song of Songs 2:3 and Proverbs 1:22 is "to delight." It can also be translated "pleasant," and is found that way in slightly altered grammatical form (n-h.-m-d) in Genesis 2:9; it is found without the prefix in Isaiah 32:12 and Ezekiel 23:6, 12, and 23. I should also mention that this inscription was apparently on a broken down rock wall in the middle of nowhere in Wadi el-Beihan in Yemen. I do not believe it is metaphorical or allegorical. I think this was the site of a tent - possibly evidencing early monotheistic worship in Yemen - and that this wall memorialized a ceremony in the tent - or something of that nature. * I suppose it's not certain that the character is actually a Z. rather than an S. - though there is no evidence that the latter looked like this, and this sibilant is otherwise pretty close to both North and South Arabian paleographic variants. Given that this is more or less the spitting image of the South Arabian character, and Z. is the correct orthographic choice for that root (which would later merge into S. in some dialects, including Hebrew), I think it's more likely that this is in fact Z. and simply predates that merger as with a number of contemporary dialects including Ugaritic. ** This seems like it must be an enclitic M. See Gen. 14:6 (בהררם שֵׂעִיר - "in the[ir] mountain Seir" (ב-הרר-ם שׂעיר)); Isaiah 10:5 (בידם זעמי - "in the hand of my rage" (ב-יד-ם זעמי)). *** I initially interpreted this as an offshoot of the 'L logogram found in the vertical Wadi el-Hol inscription. This would clearly be the most problematic aspects of the read, but I note that there is a weird substrate of this character permeating Sinaitic, Wadi el-Hol and then plausibly this. Alternatively, it could be a variant T., however. There is a Hebrew root very obscurely present in the Bible: Job 38:36 - מי-שׁת בטחות חכמה ("Who has put in the 'inward parts' wisdom? "), and Psalms 51:8 הן-אמת חפצת בטחות ("Behold truth you desired in the 'inward parts'..."). It can also mean bowshot, but more interestingly means "plaster" more commonly in the Bible, including with a secondary meaning of something like "smeared" or maybe "blocked" or - perhaps "covered" figuratively: Isaiah 44:18 - כי טח מראות עיניהם ("Because the sight of their eyes is blocked."). *** I think the root meaning is essentially "cover" and here referring to a "covered place." Though 'HL in theory can mean "dwelling," it really does not extend semantically beyond "tent" in the Bible, and I think it's reasonable to restrict it to that meaning. Thus, I suggest that this refers really to an inner or further enshrouded tent. **** Update: I misspoke here; I was referring to certain variations in North Arabian scripts.